Elvis Presley passed away at a young age of 42 in 1977. His death created a void in the hearts of music lovers the world over. Elvis & Friends is a tribute to the legend that was Elvis - both the man and the performer. 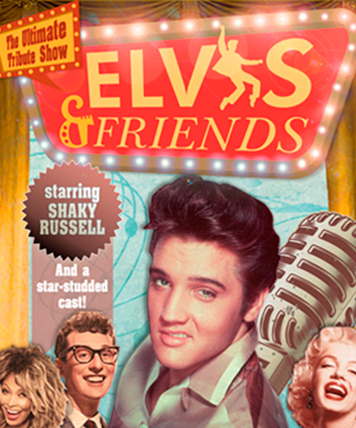 Elvis & Friends is a spectacular musical tribute to the greatest rock star of the 20th century. This awesome tribute show is a non-stop nostalgic party that takes you back to an age of discovery when people enjoyed life and rocked like there was no tomorrow. The show captures the onstage excitement of Elvis’ greatest performances and energetically reproduces hits from the 50s, 60s and the 70s Vegas-era. Reliving the magic of the king is Shaky Russell accompanied by a top level band, singers and wearing costumes which are of true reflection in every detail. Shaky recreates it all with stunning authenticity - the voice, the look and the moves. You can also expect a few surprises from other music legends including Tina Turner, Buddy Holly, The Shadows, Sha Na Na, Neil Diamond, Marilyn Monroe and more. Put on your Blue Suede Shoes, get ready to Shake Rattle and Roll ‘cause this show promises to rock both young and old in true Vegas spirit.